Also available as an Audio Book, read by the author. While some of the material in this book is also addressed in Everyday Enlightenment, No Ordinary Moments contains material covered in none of my other books, including: “Universal Addictions” and “When the Going Gets Tough” as well as other core issues of life. 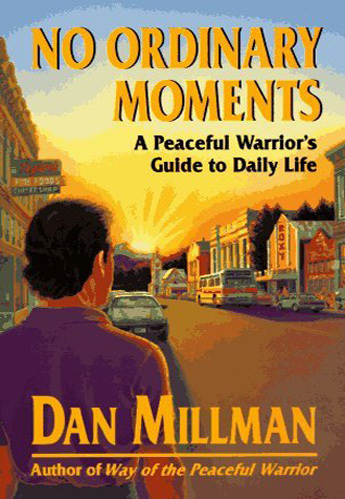 I wrote No Ordinary Moments in 1991-more than ten years after Peaceful Warrior. I had met other significant teachers and gained fresh insights. So, in response to reader requests, and leaving my path as a “teacher through fiction,” I began a series of non-fiction guidebooks. So this book contains every insight I could offer at this point in my life on every significant topic related to practical spirituality. No Ordinary Moments contains material I don’t address in any of my other books. For example, the chapter on “Universal Addictions” helps to clarify the meaning and source of all addictions, and gives tools for insight and management of our lives while recognizing our human frailties. And many have found the chapter “When the Going Gets Tough” an encouraging and hopeful reminder for those facing one of life’s adversities.